Is your master bath outfitted with radiant heat floors? Modern master bathrooms are trending towards a desire for personal indulgence. What was once a cramped, utilitarian space is quickly transforming into a highly customized spa-like experience. “We’re starting to put in more luxurious items,” says Sara Ann Busby, National Kitchen and Bath Association president-elect. 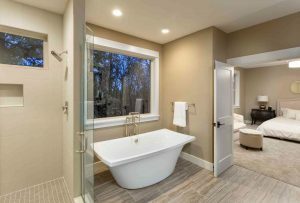 While a bathroom only really needs a functioning toilet, sink, tub and/or shower, there are a number of things you can add to make your master bath so much more enjoyable to use. Here are a few must-haves for your next remodel. Most people prefer having their own sink, and this goes doubly true if you and your partner have differing ideas about what constitutes a clean sink and faucet surface. Investing in two sinks for your master bath can save you a lot of headaches. It’s also worth considering undermounted sinks, or sinks that are attached to the underside of a countertop and have no raised rim. Although these sinks require a water-resistant countertop, they make sink cleanup so much more convenient because there’s no lip to trap grime. Stepping onto a cold tile floor first thing in the morning is a bone chilling experience that you should not have to endure every day of your life. Stepping onto a heated floor is like wrapping yourself in a warm blanket right out of the clothes dryer. This is also a very efficient way to evenly heat the room unlike conventional heating sources that first blow out cool air trapped in your ducts. Heated floors can work off an independent electronic thermostat that you can pre-set to come on just before you wake up to provide you with a comfortable room for your morning routine. This is especially a must for those rooms over an unheated space like a crawl space or garage or if you have high ceilings where all of your heat has left where you need it most. A common trend in European countries is to have a separate area dedicated to the toilet. Although this requires more space, it does provide another layer of privacy. Bidets are somewhat obscure to most Americans even though our neighbors across the pond have been using them for many years. As most bathrooms don’t have the space or are not set up for a separate fixture like a bidet, washlet toilet seats have become very popular. Installed in place of your ordinary toilet seat, your commode is now ready for double duty (no pun intended). If you’re a germaphobe or simply find your hands full all the time while in the bathroom, a single-handle faucet that can be motion activated may be a worthwhile investment. It may also save water or prevent an overflow in a child’s bathroom should they have a problem leaving the water on when they leave the room. A built-in soap dispenser is another nice-to-have feature if you don’t like to see bar soap melt away in a sloppy soapdish. Accessibility into your shower has become popular especially with those wanting to age in their own home. Stepping over the apron of a tub or a high shower curb could lead to injury. Some curbless showers can be sloped so the need for a shower door is not required to keep the water from running onto the main floor. While this may be a little more drafty while showering, it will reduce the amount of glass to clean and could be less expensive. This entry was posted on Monday, November 28th, 2016 at 3:37 pm. Both comments and pings are currently closed.